Rare diseases are defined as those that affect less than 1 in 2000 people, according to the Rare Disease Foundation of Canada. There are approximately 7,000 known rare diseases, most of which are severe and chronic and many are life threatening. Combined, an estimated 3,000,000 Canadians are living with a rare disease. This is a higher disease prevalence than either cancer or diabetes. But, when considered individually, these diseases have extremely small patient populations. These small patient populations present major challenges for advocacy efforts. They make it difficult to attract both the interest of health policy makers and funding for rare disease drug discovery initiatives. When it comes to developing an effective national strategy on rare diseases, Canada lags behind other countries. Like their counterparts in Europe and the United States, Canadian rare disease advocacy groups are coming together to present a unified voice. Health policy decision makers would be wise to heed this large and significant community. There are over 160 national and regional rare disease advocacy organizations in Canada. Collectively, through social media platforms they can mobilize 103,000 followers on Twitter and over 135,000 followers on Facebook. By comparison the social media network for the Canadian Cancer Society has 49, 000 Twitter followers and the Canadian Diabetes Association has 21,000. 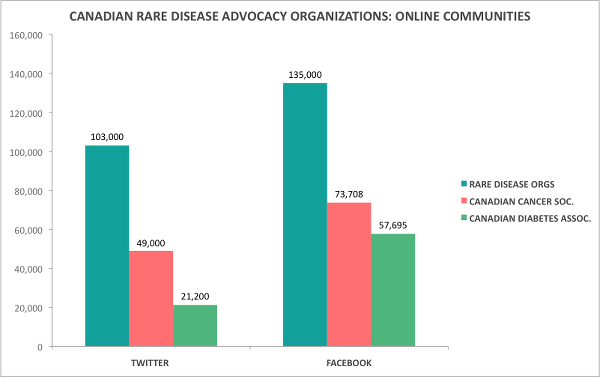 Building unified networks through umbrella organizations like the Rare Disease Foundation, the Canadian Organization for Rare Diseases (CORD) and the Quebec Coalition of Orphan Diseases (RQMO) rare disease patients have and will continue to make their voices heard through traditional and social media. If Canadians want a health care system as good as any in the world it needs a rare disease strategy that ensures that the needs of 3,000,000 Canadian patients are not ignored.